The second annual Art in the Park exhibition kicked off last night in Worcester’s Elm Park. 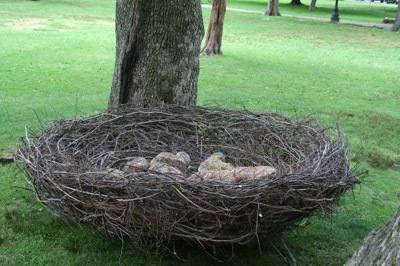 The Worcester Cultural Commission’s exhibition (with funds provided by the Massachusetts Cultural Council) features 15 artists who created 20 large-scale contemporary sculptures. The exhibit runs through the end of September. Artists include Lisa Barthelson, Rutland; Michael Frassinelli, Holliston; James M. Kitchen, Chesterfield. Watch this interview of them discussing their work. Be sure to see today’s Worcester Telegram & Gazette as well as this video for more on the show. Learn more about the MCC’s Local Cultural Council Program.